NordicTrack FS9i vs FS7i FreeStride Trainers | See What the Experts Say! I have been researching the Nordic Track FS7i. Really enjoyed your site and video on YouTube. 1) I am just looking to do basic workouts. Is the FS9i worth the extra $1000 over the FS7i? 2) I have a read a lot of positive reviews on the FS7i and really like the different motion options. I have also found a few sites where there are many complaints both about the quality of the machines and the level of service from Nordic Track. What is your opinion of NordicTrack’s machine quality and customer service? NordicTrack FS9i vs. NordicTrack FS7i: Which Should You Buy? I see no justification for the $1K extra price on the FS9i. The upgrades are worth maybe a few hundred more. The main difference between these two machines lays in the display. The FS7i has a 7″ web-enabled color touchscreen and the FS9i has a 10″ web-enabled color touchscreen. The FS9i also has 25 lbs more weight capacity, 2 more resistance levels, and 3 more workout apps. The FS7i is already a fantastic machine and these small feature additions certainly do not warrant spending an extra $1000. That is why we feel that the FS7i is the Best Value. 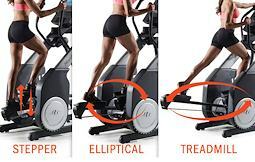 Read more about the FreeStride Trainers from NordicTrack in this article. 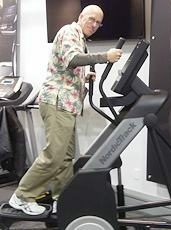 Regarding the quality of NordicTrack machines and their customer service. 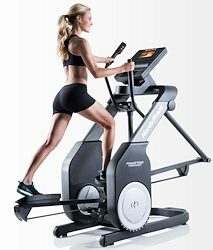 NordicTrack is part of a monster company called Icon Fitness that is the world’s largest supplier of fitness equipment. They’ve got a lot on their plate in terms of customer service requests. They have gone through a major POSITIVE transition in the last ten years. Their customer service has undergone vast improvements since we first visited their facilities in 2007. Ten years ago, when our team first visited, the head of service, Dan Jones, said they were committed several million dollars to improve the quality of their customer service and it shows. NordicTrack offers some of the best value in their price range not necessary because they are the most durable and long-lasting. For the price, they offer a lot of features you won’t find on other machines. For example, their iFit Live technology is one of the best motivational and training systems on the market. Are There Other Brands You Should Consider? If you are more concerned about a very durable and high quality machine with fewer bells and whistles, you may want to consider another brand like Sole Fitness. Sole machines don’t quite stack up in terms of innovations and “the latest and greatest” but their machines are very high quality and will last you a long time.